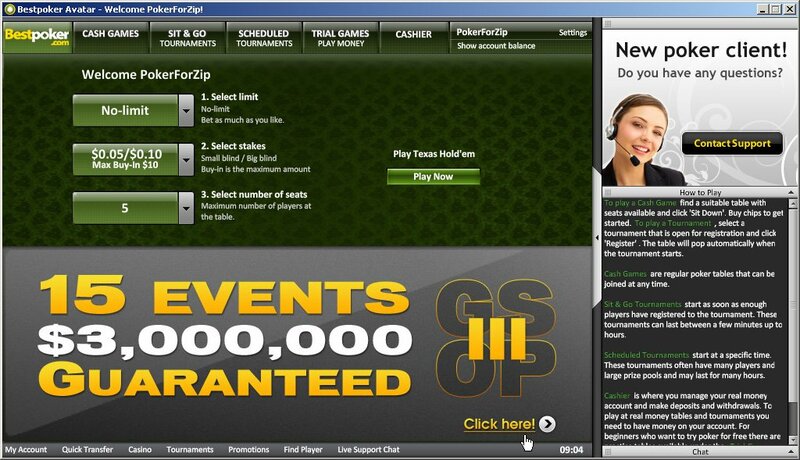 BestPoker moved to the Ongame Network in 2007, one of the world's largest gaming operators. This move came as an surprise, but now almost two years later it can be seen as a huge step forward. Joining Ongame gave BestPoker a lot more opportunities, specifically to become a larger player in the European market - as they were mostly known in the Scandinavian market before. According to BestPoker, they focus on fun, ease of use, reliability and security. This fits perfectly in the profile for a site that's one of PokerBonusHelp's recommended online poker sites. In the following part of our BestPoker review you can read in-depth information about BestPoker's client, website, security & integrity, traffic & games, bonuses & promotions and support. The Ongame software features great compatibility. Their main downloadable poker client is Windows (PC) based, but you can play BestPoker's instant play version on any other platform (Mac and Linux). Their instant play version works in a Java-enabled browser, giving you almost all the same cutting-edge game features and functionality as they offer in their downloadable application. One thing we didn't like about BestPoker, or rather Ongame's poker client in general, is that certain features aren't taken care of within the client its self. For instance, to access the cashier you will be redirected to your browser. Cash game players will love the quick seat feature, but if you are a sit and go player, you will find yourself struggling signing-up, especially during peak hours when SNG's fill up quickly. A simple filter or the ability to disable running and finished tournaments would make it a lot easier, hopefully they will implement this at some point. Feature wise BestPoker goes with the flow. They offer standard options like four color deck (they call it big card symbols), auto play checkboxes, player notes (including categorization) as well as the ability to play either in mini view or full screen mode. Unfortunately you can't customize the size of just one table, when playing on multiple tables. At BestPoker you can choose between several bonuses, so there's always one that suits your personal level of play. All the bonuses have recently been upgraded from lump-sum bonuses to incremental bonuses, which means you will get a part of the bonus each time you have earned the required amount of Player Points needed per installment. The bonuses offered on Poker For Free start as low as $50 (which clears in 5 installments of $10 at only 80 PPs each) and go all the way up to $3,000 (which clears in 2 installments of $1,500 at 12,000 PPs each). Promotions on BestPoker run all the time, be it an EPT satellite or the King of the Hill promotion which is BestPoker's equivalent to the steps sit and gos offered by other online poker rooms. The most interesting promotions however are announced on the homepage of BestPoker.com. Take current Cashback promotion, where you redeem your Player Points for real money, up to 40%. Now... who says Ongame doesn't offer rakeback! BestPoker is registered on Cyprus and is part of BestGames Holdings Ltd, which is their mother company, registered in the United Kingdom and listed on the Frankfurt Stock Exchange. BestPoker guarantees that they take tremendous care to provide all of their players the safest place to play online poker. Effectively this means they have a zero tolerance policy when it comes to fraud and collusion. They have implemented extended technology, which is deeply integrated in multiple tiers of their client and server's architecture, to detect possible collusion. Players who are caught in the attempt to cheat will have their accounts closed and loose the right to withdrawal their balances. At BestPoker, the level of game play is slightly over average, but varies per poker table. You can sign up as a beginner, but be careful not to play above your personal level. Advanced poker players will definitely be able to play profitable poker at BestPoker! The size of the Ongame Network (over 30,000 simultaneous poker players online at peak hours) guarantees you that you should always be able to find a table that suits your level. BestPoker also offers a very nice feature named BestPoker Replay. This is where you can post your own interesting hands, as well as watch hands played by other poker players and leave your comments. 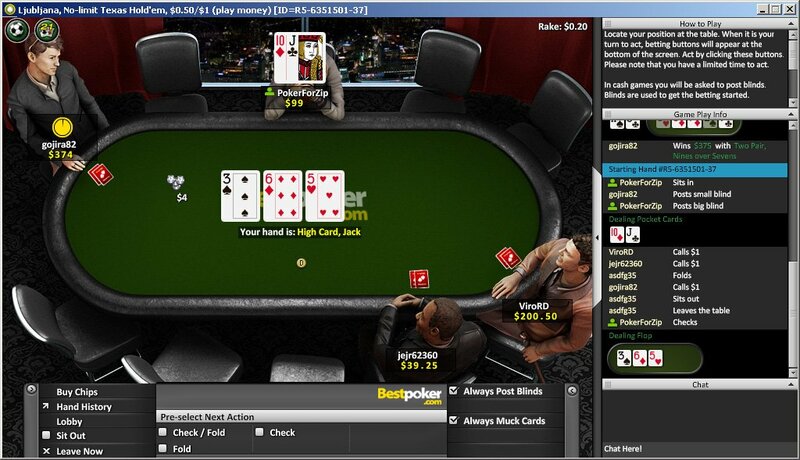 The BestPoker Replay interface enables you to see some of the biggest pots and greatest plays, over and over. When they changed platforms, they also changed the look and feel of their website. BestPoker.com is a standard three column website with call to actions in the middle and player and tournament information in the right column. In the left bottom corner of the homepage you can see four playing cards. Amongst these cards there's one that leads to BestPoker Replay, which we've mentioned in the topic Traffic and Game Variation. To the point, BestPoker contains a lot of valuable information for existing and non-existing players. Let's start by telling what you can expect when you aren't logged in at BestPoker. First of all, you can find information about how to get started, i.e. from creating an account and depositing money, to either downloading the BestPoker client or using their instant play version under menu item Get Started. Since BestPoker is one of the few sites who also offer a client for mobile phones, you can find a menu item (MobilePoker) fully dedicated to mobile poker. Under the next menu item, Tournaments, you will find an overview with descriptions of their most prominent online poker tournaments, as well as a live tournament schedule (there's also a separated schedule for guaranteed tournaments). Ongoing promotions and temporary promotions are announced under Promotions. Last but not least is the Poker School menu item, where you can find the basic rules for the following poker games: Texas Hold'em, Omaha, 5-Card Draw and 7-Card Stud. Next to rules, you can read about anything else that goes with the game of poker: betting structures (limit, no-limit and pot-limit poker), poker tournaments (types, satellites, rebuy and addon, etc.) and information about common poker words and chat lingo. Something very interesting to read as a player that might sign-up are the pages about BestPoker's VIP Club. Now, players that choose to sign-up at BestPoker.com have a few more options after logging into their account. Of course you will now get access to the cashier and if you already have a bankroll, you will also be able to transfer funds to your buddies (which, by the way, you can keep track off in a buddy list). Your account also contains your VIP status, your Player Points amount and a personal Inbox, whit occasionally an offer for a reload bonus. BestPoker offers excellent support to its clients. They have various methods available to get in touch, including toll free phone numbers, live chat and e-mail. We have experienced a little problem when we registered a testing account and were helped quickly by the friendly staff over a live chat session. In general, we would recommend the live chat option, though they are only open during working hours. You can see the actual status on BestPoker.com, in the right column all the way to the bottom.